Life in Istanbul happens on the street. In the mornings, people sit in improvised tea gardens sipping small, tulip shaped glasses of tea and smoking the day’s first cigarette. In the afternoons, women-particularly in the city’s poor, working class neighborhoods- sit on the steps of their apartment buildings exchanging gossip and commiserating about life’s troubles as their young children chase cats and play ball with each other. On summer evenings groups of friends sit at street-side tables with large bottles of raki and a selection of mezzes telling stories and laughing about life. The Istanbul street is never a lonely or a boring place. There is always someone to talk to, somewhere to go, something to do. 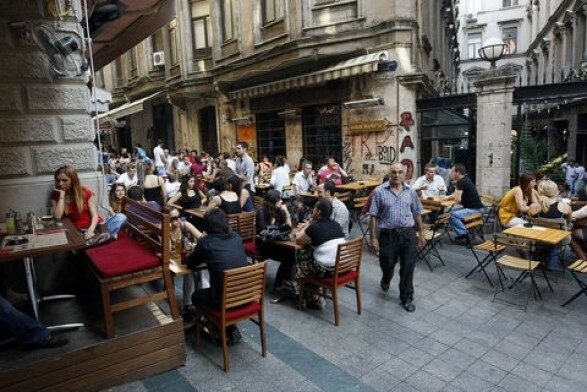 During the summer of 2011 the tables disappeared from Beyoglu. Apparently, the prime minister’s motorcade was unable to pass through the narrow streets of Asmalimescit and he ordered the district council, which is controlled by the ruling AKP, to remove all the street tables. Over the course of a few days in early July, large flatbed trucks drove around the district confiscating outdoor tables and chairs from cafes, restaurants, and bars. It was a few weeks before the start of Ramadan and many people suspected that removing the tables was an attempt to curb public alcohol consumption and police behavior according to the AKP’s vision of Islamic morality. The AKP’s attempt to redefine the nature of urban space in Beyoglu predates the Taksim Barracks Restoration Project. After the tables were gone, people devised a number of ways to sit on the streets. Some restaurants built small platforms with tables. Others opened their fronts and provided customers with cushions so they could perch along low windowsills. Still it wasn’t the same. Without the business street-side tables attracted, many establishments were forced to close their doors. On the evening of Wednesday, June 5, as I walked down the street where I spend much of my time in Istanbul, something felt different. After a walking a few paces, I exclaimed to myself, “The tables are back!” People sat with bottles of raki and mezzes smoking cigarettes and laughing. Others sat in front of bars with glasses of beer and small bowls of nuts conversing with friends. This everyday act, which had once been a regular facet of life in the district, had returned as a deliberate jesture of resistance against the planning policies of the AKP and its neoliberal, Islamist vision. The festive mood continued on Sunday, June 9, and the tables were still out. Cafes and bars that are usually closed on Sundays were open. The streets were so crowded that people were smoking inside despite the ban on indoor smoking that has been in place for nearly five years. The protests had overflowed into the small “finger” streets that surround Taksim Square and the Gezi Park. At first, I thought he was telling me that taking pictures was forbidden. I was momentarily confused. “For what purpose are you taking pictures?” he asked. “I wanted to put a picture of this on my blog,” I said as I gestured to a group of diners. He seemed a little relived, but still anxious. “You know it is forbidden for tables to be on the street. I could get a 3,000 YTL fine.” I showed him the picture I had taken. “The name of your establishment is not in my picture,” I said. “That may be so, miss, but this is forbidden and I could be seriously fined.” “No, no, of course, I wouldn’t want anything like that to happen,” I insisted. As I walked away, I erased the photograph. No, of course, I wouldn’t want anything like that to happen.